Nobody likes that dreaded moment when you’re renovating a bathroom with diligence and care, picking out the ideal bath, shower and sink and never going over budget, then suddenly realise that something’s missing. This happens all the time with the smaller fittings in the room, because not everyone realises that bath room units are sold in parts. 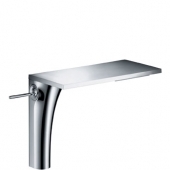 For example, the washbasin is often sold separately to the taps. The fact is, however, that companies do this for good reason; it allows you to have more control over the customisation of your design. So when you’re budgeting for the perfect, stylish basin, remember to leave room for the perfect faucet, too. If nothing else, it’s important to check how the basin and taps will look together as a whole. Thankfully, most brands offer a matching set within one range, or a few options that offer different functions. With a little browsing on web stores, you can usually find a discount solution without losing out on style. 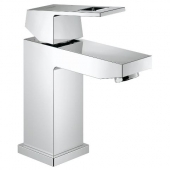 There are a few options available to you when it comes to mixers for your basin. Sometimes this will be limited by the sink you choose, so it’s worth browsing for both at the same time. Have a look at these common types that might spark some design ideas. Single handle. 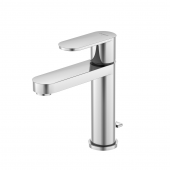 With just one point of control, a single-lever mixer is very minimal and elegant. Temperature is controlled by which way you turn the lever. Two handle. Consider this if you want separate hot and cold in the traditional style, with a sense of symmetry. Three-hole tap fittings. Some basins have three holes, for two-handle mixers where the handles are mounted apart from the spout, or for a third fitting like a hand shower. Wall-mounted tap fittings. You can have your mixer mounted directly into the wall for a very seamless appearance, great for sinks without any holes. Standing Fittings. 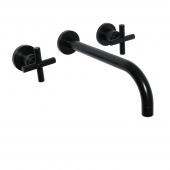 These stand-mounted faucets are needed for some free standing basins that do not have any holes, plus also for some baths. The above should give you a starting point for your search. Consider the type of faucet you like, how it will look in the room and who has to use it. For example, people with mobility issues often prefer a lever to a round handle. Deciding on these elements will make it easier to choose a range for your sink. 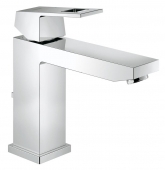 Remember to shop around online for a deal on your basin mixers. You may be surprised how cheap it is to buy from designer ranges that add aesthetic appeal to the humble sink. Remember that you can be limited by the options in a certain range, so look at the washbasin and faucets as a whole and match them to the other décor aspects in the bathroom. 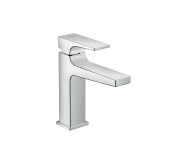 Three leading brands are Grohe, Ideal Standard and Hansgrohe, which represent a good place to start your search. 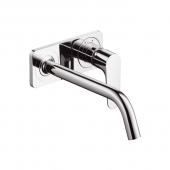 Grohe have the Eurocube range for some really eye catching, cube shaped single-lever mixers, or have a look at Grohe Europlus for a standing tap that will suit free standing basins. Both have their trademarked StarLight chrome finish for a perfect shine. 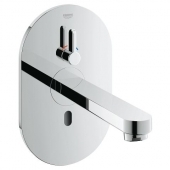 Hansgrohe meanwhile offer the Focus E2 single lever mixer which leans forward and has a ceramic cartridge. 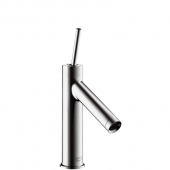 Hansgrohe Logis is an option for wall mounting, perfect for a minimal, concealed installation. Consider Keuco as an alternative for style, with the Elegance range which has a neat rotating handle and Keuco Plan for a great sensor operated mixer, perfect for those with arthritis. 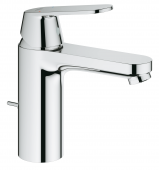 Ideal Standard have some models that offer a low pressure solution, such as the VITO range. 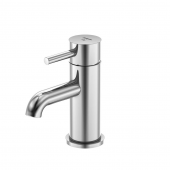 Also check their Melange range out for almost organic looking faucets. For something really different, Dornbracht Tara includes matte black two-handle faucets that will suit a super-modern room. 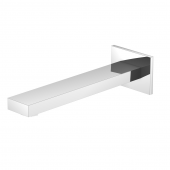 Dornbracht also produce eMOTE for a high-tech, wall mounted infrared unit. Consider Jado Geometry if you prefer elegant, angular shapes and Kludi BOZZ for a tall, long-piped mixer suitable for larger basins. Lastly, Steinberg are a good choice for a three-hole mixer with a curvy style. Take these as cues for finding your design inspiration. You can get the ideal washbasin for your bathroom scheme without spending much money, if you start from the taps down!